− distance from each satellite. 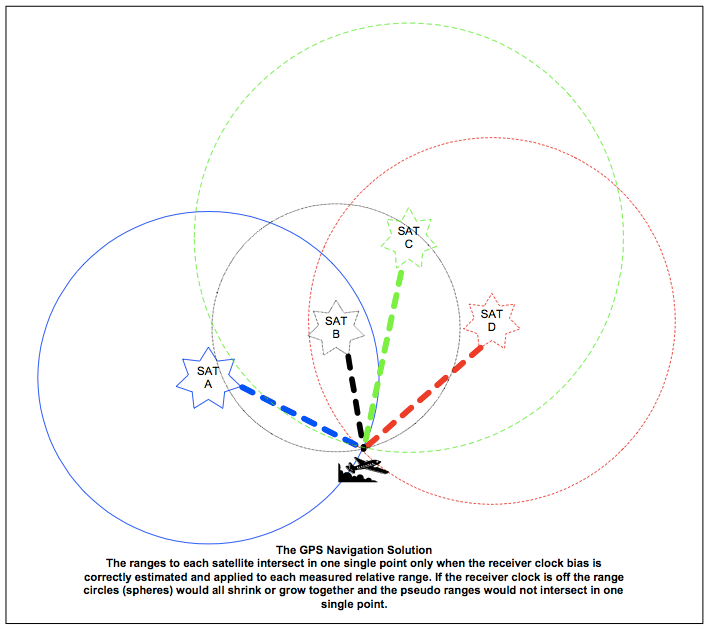 Measuring the distance to three satellites allows triangulation to a 3D-position fix since the receiver must be at a position where three spheres intersect. The ambiguity is solved by the receiver since one of the two intersecting points leads to a ridiculous answer. The receiver obtains satellite almanac, ephemeris and clock data from the digital data words that comprise the navigation message broadcasted by all satellites. The almanac (or time table) consists of generic satellite constellation data from which the receiver determines which satellites are in view and could be used for navigation. Ephemeris data provides detailed data about the orbit of the selected satellite and together with the clock data the receiver computes the precise satellite X, Y, Z, position relative to the earth centre at the moment the navigation solution is computed. In this formula the constant (V) represents the speed of light (and radio waves) in vacuum (~300.000 km/s). Thus, an accurate clock with nanosecond resolution is needed to measure the travel time of the radio wave. A measurement error of 1/1000 of a second would mean an error of 300 km. Measuring the distance to three satellites only would lead to an error since the cheap quartz clock in the receiver is simply not as good as the atomic clocks in space. The receiver clock will have some, yet unknown, error and the ranges found initially are called pseudo ranges. For a 3-D position and time fix a minimum of 4 satellites must be received. Initially the GPS receiver calculates position in ECEF (Earth-Centred, Earth-Fixed) X-, Y-, Z-, co- ordinates. Subsequently de data is converted into the WGS 84 geographic co-ordinates providing Latitude, Longitude and Height (φ, λ, h). The WGS84 reference system becomes important when GPS position information is used in reference to maps, charts or data bases based on one of the many (hundreds) other geodetic reference systems. Substantial differences, up to 1000 meters, in positional accuracy may result from mixed use of geodetic reference systems, basically describing an approximation of the geodetic shape of the earth. A GPS receiver without any previous knowledge of the satellites almanac, its position, and time may require up to 15 minutes from a cold start before the first navigation solution is presented. This is caused by the time it takes to initially receive and load a complete almanac in its memory from a satellite that must be found through trail and error. Once an almanac is loaded it remains valid for a long time and when also a previous/last position and time is still known or initialised to the approximately correct values the TTFF is reduced to minutes. Energy is sparse in space and the satellite signals received are unbelievable weak. The signals from space arrive at a very low pica Watt level, so weak in fact they are lost below the thermal noise level (noise from electronic components due to random movement of electrons in the atoms). The weak signals are easily shielded by buildings, terrain, or other obstacles. Reducing the number of satellites in view. Also, the weak signals can easily be interfered with from other radio sources. Intentional interference (jamming) is a concern and unintentional interferences are always possible, disabling GPS over a large area. NOTE: A 1 Watt jammer on the ground may render the GPS useless for a large area. Military exercises including intentional jamming are known to exist. Black holes in the GPS coverage area occur and when known NOTAM’s will indicate where and when GPS signals are unreliable for use. A typical sample NOTAM is shown below. At the given time, this sample was taken from, up to ten (10) similar NOTAM’s were active in the USA alone. The GPS navigation signal will be unreliable within a 33NM circle around the Augusta VOR (AUG) from the surface to FL400, IFR operations based upon GPS navigation should not be planned in the affected area during the periods indicated. These operations include domestic RNAV or Long-Range navigation requiring GPS. These operations also include GPS standalone and overlay instrument approach operations. A major contributor is Selective Availability (SA), an artificial inaccuracy applied by the military to deny the highest accuracies to the enemy, and civil users. FAA’s position integrity performance requirements for GPS use as a Supplemental navigation system to support e.g. overlay Non-Precision Approaches (NPA) are given below. Sole Means of navigation requires additional augmentations to reduce the probability of attaining misleading information within a one-hour period to 1E-07. This is presently not available and may prove to be not feasible with the present GPS. Augmentation techniques are being developed to improve upon GPS inherent navigation accuracy, integrity, availability and continuity. RAIM improves added integrity by monitoring the (4) satellites used against more satellites. DGPS improves accuracy and integrity by monitoring the satellites against ground stations. Pseudolites improve availability and continuity by adding pseudo-satellites on the ground. RAIM is applied in the present aviation GPS receivers. Other augmentations are in development for future use.